Groundwater such as wells and surface water such as rivers and lakes are important sources of water for drinking and recreation in the United States. In recent years, reports of bacteria, nitrogen, chemicals, and other pollutants in groundwater and surface water have increased concerns about its quality. What causes water pollution? This fact sheet answers that question and discusses ways to protect water quality. Clean water is a valued resource for human and farm animal use, recreation, irrigation, and fish and shell- fish habitat. Pollution of our groundwater (such as wells) and surface water (such as rivers and lakes) is a concern across the United States. Point source pollution comes from a single source such as a pipe or ditch. Non- point pollution is the result of many small pollution sources. 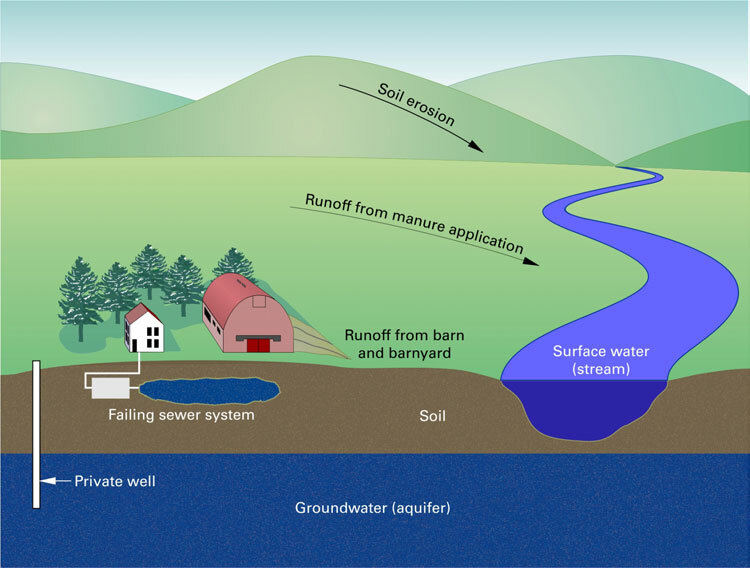 Figure 1 shows many of the interrelationships that occur among soil, manure, crops, and water and how nonpoint pollution occurs. rain or irrigation than it can hold. 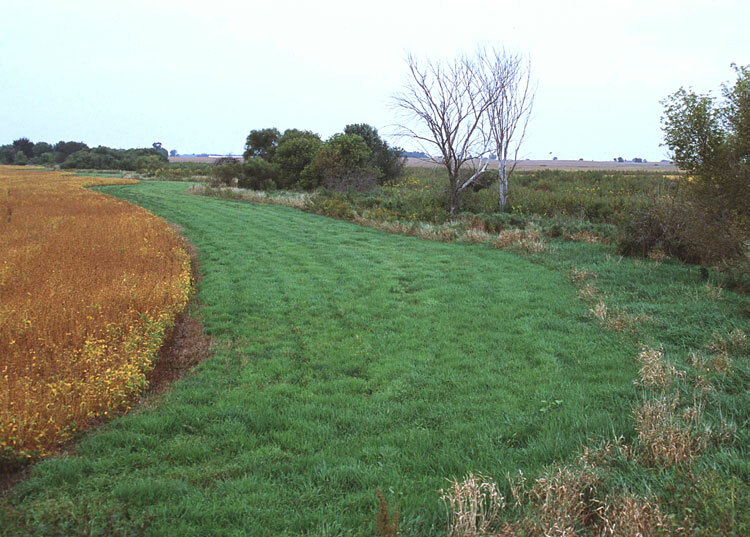 Areas that have been over- grazed, are not covered with grass, and where farm animals loaf can increase the chances of runoff (Figure 2). Pollution of surface water can occur from both point and nonpoint sources. In most cases, poor groundwater quality occurs when runoff containing dissolved nutrients and pesticides moves through the soil to the groundwater. This process, called leaching, is a natural one. from commercial fertilizers, manure, and sewer systems. Water can be polluted by pesticides; bacteria from manure or failing sewer systems; and nutrients from commercial fertilizers, manure, and sewer systems. 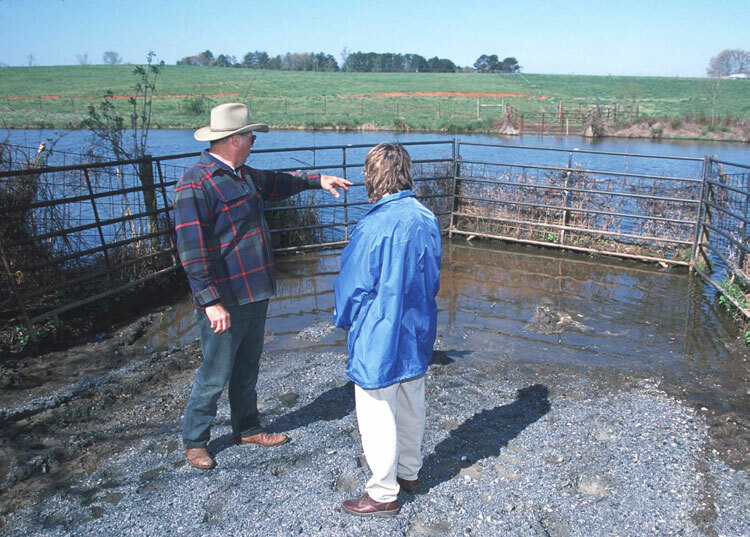 Several good management practices have been successful in protecting water quality. Three of these practices are fencing (Figure 3), limited animal access to streams and ponds for drinking water, and buffers along streams and rivers. 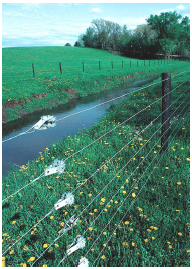 The practices of fencing and limited access are meant to keep animal from having unlimited access to water and causing water quality problems (Figure 4). 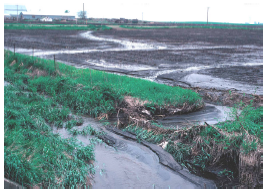 The buffers along streams and rivers trap manure nutrients and bacteria, preventing them from entering surface water (Figure 5). Manure is a good source of the main nutrients needed for plant growth: nitrogen, phosphorus, and potassium (see Small Farms fact sheet titled “The Value of Manure”). In addition, manure can provide organic matter. The organic matter increases the soil’s ability to hold water and helps improve the soil’s quality. Manure is a good source of the main nutrients needed for plant growth. The challenge for small farm owners who have animals or use manure as fertilizer is to know and use good manage- ment practices. These practices keep manure from washing into surface water and prevent nutrients like nitrogen from seeping into groundwater. Properly managed crops act as a filter to keep manure nutrients and bacteria from reaching groundwater (like wells) and surface water (like streams and ponds). Properly managed crops act as a filter to keep manure nutrients and bacteria from reaching ground- water and surface water. One simple rule to keep in mind is to collect manure when plants are not growing and apply it when they are growing. This works well with grasses but not with corn silage and annual grain crops such as wheat, barley, or oats. With these annual crops, the manure will need to be stored during the growing season and applied either before planting or after harvest. One simple rule to keep in mind: collect manure when plants are not growing and apply it when they are growing. nitrogen is formed when small organisms in the soil change organic nitrogen to ammonia-nitrogen and then to nitrate-nitrogen. When more manure nitrogen is applied than the plant needs or at times when the plant does not need it, extra nitrate- nitrogen can build up in the soil. When heavy rains occur or there is too much irrigation, the nitrate-nitrogen can be “washed” past the plant roots through the soil to ground- water. As a result, plants may lose nutrients and wells used for drinking may have higher levels of nitrate-nitrogen. as for recreational and commercial shellfish growers. When the nitrogen and phosphorus in manure wash into surface water, it can result in a “nutrient-rich” environ- ment in the water. In nutrient- rich water, algae can grow at unusually fast rates. When it dies and decays, too much oxygen may be removed from the water, which can then cause fish kills. 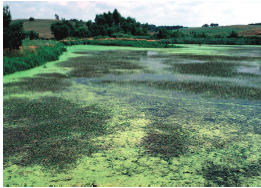 Runaway algae growth can also cause discolored and bad-tasting water (Figure 6). When dirt washes from in streams and rivers. It may cover gravel beds needed for fish spawning (development of fish eggs). When the nitrogen and phosphorus in manure wash into surface water, it can result in a “nutrient-rich” environment in the water. Soil helps protect ground- water (like wells) and surface water (like streams and ponds). Soil can remove possible pollutants from run- off as it seeps through the soil toward groundwater. Some pollutants become attached to the soil particles. Small organisms that naturally live on these soil particles can digest the pollutants and change them into harmless materials. Soil can remove possible pollutants as runoff seeps through the soil toward groundwater. Soils that contain small amounts of organic matter, or clays, do not “hold” some pesticides well. Avoid over-applying pesticides on all soils, but especially sandy soils. Disease-causing bacteria and viruses from sewer systems and manure application do not live long on most soils. They can enter groundwater and surface water under two conditions: When (1) the soil is extremely coarse (contains lots of gravel and sand) and (2) manure is over-applied and then is washed away by rain. Nitrate-nitrogen can be removed from soil in two ways. Plants use it as a nutrient. In addition, some soil organisms can change nitrate-nitrogen to a nitrogen gas when soil is waterlogged (usually during heavy rainy seasons). Manure is a good source of the nutrients needed for plant growth. Properly managed crops act as a filter to keep manure nutrients and bacteria from reaching groundwater (like wells) and surface water (like streams and ponds). Too much nitrogen and phosphorus can cause surface waters to become overloaded with nutrients. Soil helps protect ground-water and surface water. Heavy rains or too much irrigation may cause nutrients and pesticides to seep through the soil. Joe Harrison, Nutrient Management Specialist, Washington State University, can be reached at 253-445-4638 or jhharrison@wsu.edu. The author wishes to thank Bob Stevens, Washington State University; Dan Sullivan, Oregon State University; Chris Clark, Whatcom Conservation District; and Bobbi Lindemulder, Snohomish Conservation District, for their review of this fact sheet. The local contact for your land-grant university Cooperative Extension program is listed in the phone book under “Cooperative Extension” or “(county name) County Cooperative Extension.